Nokia has completed trials of its Life Tools service, providing information to India's farmers and farming communities, demonstrating how mobile phones can do more than play music and make farting noises. 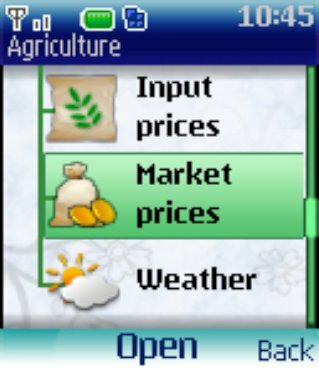 Life Tools provides an easy interface to Reuters Market Light, which delivers information on crop prices and such over the SMS network, as well as applications including exam revision guides and cricket scores, all on the most basic of handsets. The trial has been running for the last few months in Maharashtra, India, and has enabled farmers to find out how much they can expect to sell their crops for - strengthening their hand when negotiating with local agents. Agents are often also hauliers, and without connectivity a farmer is at the mercy of the agent who happens to be nearby when he needs to harvest. Without the information provided by Market Light, they would have no idea if another agent is on his way, or what price the agent is likely to get in town. In some areas, farmers have been deserting the land to become agents. Mobile telephones have revolutionised such communities, and Nokia's Life Tools continues that process by providing easy access to the SMS-driven Reuters Market Light information, using client software built in to the 2323 and 2330 handsets to be launched later this year. "I believe in working rigorously to enhance my livelihood and lifestyle and I expect that Nokia Life Tools services will help me in validating the desired information," said a suspiciously eloquent farmer and trader from Tuljapur, Amravati, in a canned statement provided by Nokia. Reuters Market Light has been around for a while, providing information at local post offices as well as via SMS delivery - farmers pay 60 rupees a month for the service, which is delivered in a range of languages. During the trail, which used Nokia 2600 and 1680 handsets, users could sign up to a range of services including Reuters as well as cricket scores, horoscopes and generic news feeds, as well as farming advice.